Michael Cheezan of Wauseon runs during the NWOAL Cross Country Championships Saturday in Archbold. He won the race for the Indians as they finished runner-up as a team. 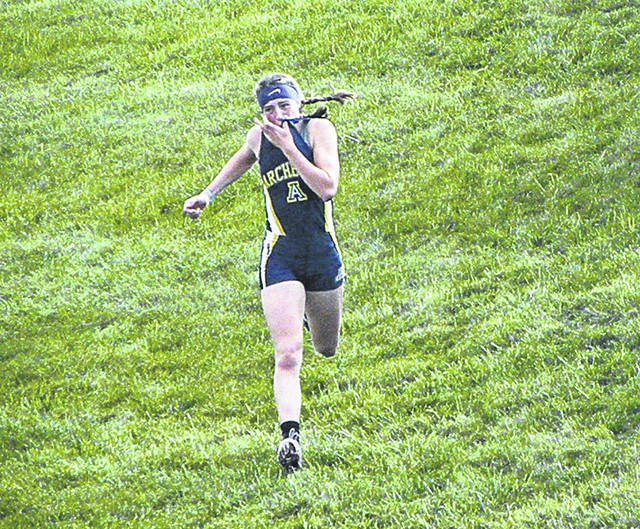 Kylie Sauder of Archbold at the league meet Saturday. She finished second for the Bluestreaks. On what turned out to be a nice day for running at the Archbold Reservoir, host Archbold (girls) and Liberty Center (boys) captured Northwest Ohio Athletic League cross country titles Saturday. Archbold’s girls placed three runners in the top 10 and had all five scoring runners earn all-league recognition. Liberty Center’s Hope Oelkrug won the race in 19:35. Archbold’s Kylie Sauder (19:47) and Dakota Stamm (19:57) took second and third. It helped in the team race, as the Streaks won the league title 41-58 over the Tigers. Wauseon (93) took third, followed by Evergreen (111), Bryan (118), Patrick Henry (140) and Delta (145). Archbold’s Karley Ramirez (21:06) and Gwynne Riley (21:45) were named second team. Brittney Ramirez (21:55) and Regan Ramirez (22:10) were named honorable mention. Evergreen’s Sarah Schwan (20:11) took fourth in the race. Kayla Gleckler (21:32) was named to the second team. Kennedy Keller of the Vikings finished in 22:29 and was named honorable mention. Wauseon had one runner named to the first team as Magdalena Duden took sixth in 20:45. Serena Mathews (21:48) was named to the second team and Hannah Richer (22:06) was honorable mention. Delta had a pair of runners named honorable mention in Jenna Hallett (22:10) and Cassandra Lee (22:21). The boys race started tight as Wauseon took the first and third spots, however, Liberty Center placed four in the top eight to edge the Indians 31-47 for the team title. Bryan (94), Archbold (98), Swanton (148), Evergreen (158) and Patrick Henry (159) rounded out the team scoring. Michael Cheezan beat Liberty Center’s Kyle Rauch by three seconds to win in 17:11. Braden Vernot took home third for the Indians in 17:23. 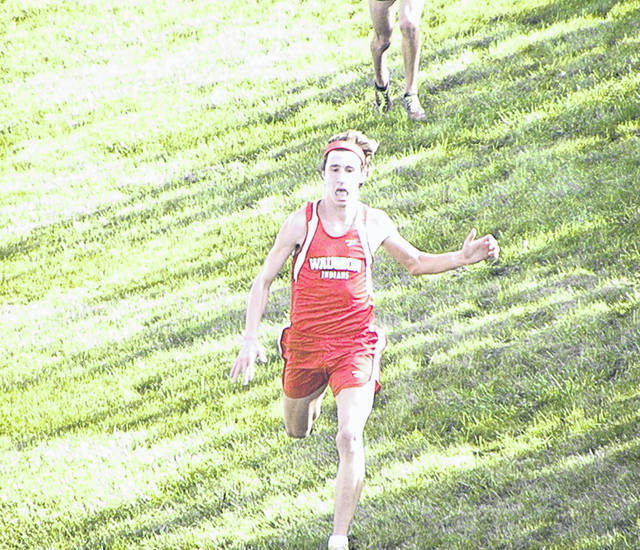 “In all honestly, that race was a lot of fun to watch,” Wauseon cross country coach Joe Allen said of the finish. “My kid (Cheezan) made a move early and pulled away. The Rauch kid, you knew he wasn’t just going to let him go. He made a move and with about 300 meters (left), he might have passed him. Michael Cheezan was able to pull away. Hunter Wasnich finished in 18:27 for Wauseon and was named to the second team, as was Carter Nofziger, who finished in 18:38. Layton Willson (18:58) was named honorable mention. “We were proud of the way those guys competed,” Allen said of his all-league guys. Swanton’s Brett Bettinger (17:35) took home fifth in the race. Evergreen’s Augie Tipping finished in 17:51 and was named second team. Archbold’s Hunter Johns (18:37) was named second team and Josh Kidder (19:04) was honorable mention. Delta’s Walker Sniegowski finished in 18:45 and was named honorable mention. The area teams will head to a couple different locations for district meets Saturday. Wauseon will run in Division II races at Ottawa, while Archbold, Delta, Evergreen and Swanton head to the Owens Community College Findlay campus. Archbold and Swanton boys race in Division II and the girls are Division III. Liberty Center 31, Wauseon 47, Bryan 94, Archbold 98, Swanton 148, Evergreen 158, Patrick Henry 159. Archbold 41, Liberty Center 58, Wauseon 93, Evergreen 111, Bryan 118, Patrick Henry 140, Delta 145.